a tune written for the descant recorder would need too many-ledger lines above the stave. The tune played on the tenor sounds as written whilst the same rune played on the descant sounds an octave higher than written. It follows, therefore, that all the statements made in the chapters on the descant instrument apply to the tenor also. The fingerings, exercises and tunes in these earlier chapters should be studied and played on the tenor recorder for the same diffi�culties will have to be overcome on the tenor as on the descant. should be practised. The tune has a lot of work for the right hand to do and should help the player to overcome the diffi�culty of playing the lower notes on the tenor. 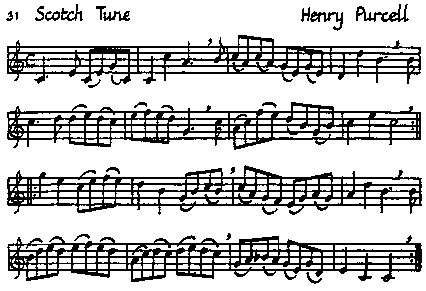 The tune also contains a large number of slurred notes, some of them very difficult to play neady. There will be the usual temptation to tongue these notes separately but this should be avoided.